The Indonesia national football team represents Indonesia in international football; it is controlled by the Football Association of Indonesia (PSSI). Despite football being one of the nation’s favourite sports, Indonesia is not among the strongest teams in the AFC. However, in history they are considered as one of the strong teams in Southeast Asia. Prior to independence in 1945, the team competed as the Dutch East Indies national football team. Indonesia, under the name Dutch East Indies, was the first Asian team to participate in the World Cup when they qualified to the 1938 tournament. A 6-0 first-round loss in Reims to eventual finalists Hungary remains the country’s only appearance in the World Cup. Dutch East Indies players line up in Reims, France in 1938 to faceHungary. In 1958, the team tasted their first World Cup action as Indonesia in the qualifying rounds. They got past China in the first round, but subsequently refused to play their next opponentsIsrael. The team suffered a long hiatus from FIFA World Cup since 1958 due to an unfavourable political situation – both internally and externally. It was only in 1974 that Indonesia returned to the fold. Indonesia’s first appearance in the AFC Asian Cup was in the United Arab Emirates in 1996, Indonesia only gained one point from a draw against Kuwait in the first round. Their second appearance in Asian Cup was in Lebanon in 2000; again, Indonesia gained only one point from three games. Indonesia performed better in the 2004 AFC Asian Cup, beating Qatar 2-1 to record their first ever victory in the Asian Cup; unfortunately this was not enough to qualify for the second round. In 2007, they were the co-host of the tournament. They defeatedBahrain 2-1 in their opening match, but lost their last two ties against Asian giants Saudi Arabia and South Korea and finished third in the group and failed to reach the quarter-finals. Nevertheless, their 2007 AFC Asian Cupperformance is considered as their best performance in the tournament. Indonesia has yet to win the regional Tiger Cup, despite reaching the final three times (2000, 2002, and 2004). Their only continental titles came in the 1987 and 1991 Southeast Asian Games. A group win in the 2004 Asian Cup tournament, their first ever in that competition, may signal a rise in the side’s stature on the Asian football scene. Under the guidance of former Aston Villa and England striker Peter Withe, the South-East Asian outfit looked set to continue their success in terms of football development and in the FIFA World Rankings. However on January 18, 2007, Withe was sacked due to their first round exit from the ASEAN Football Championshipand replaced by Ivan Venkov Kolev. Recently Benny Dollo was appointed as the new head coach after Ivan Venkov Kolev was sacked due to the team’s poor performance at the 2010 FIFA World Cup Qualifiers. The 1998 ASEAN Football Championship tournament was one of particular controversy in regards to the Indonesian team. This tournament was marred by an unsportsmanlike match between Thailand and Indonesia during the group stage of the competition. Both teams were already assured of qualification for the semi-finals, but both teams knew that the winners of the game would face hosts Vietnam in the semi-finals, while the losing team would face Singapore who were perceived to be easier, and would avoid the fuss of moving training bases from Ho Chi Minh City to Hanoi for the semi-final. The first half saw little action, with both teams barely making an attempt to score. During the second half both teams managed to score, partly thanks to half-hearted defending, resulting in a 2–2 tie after 90 minutes. Then, during extra time, Indonesian defender Mursyid Effendi deliberately kicked the ball into his own goal, despite the Thais attempts to stop him doing so, thus handing Thailand a 3-2 victory. Both teams were fined for “violating the spirit of the game” and Mursyid Effendi was banned from football for life. In the semi-finals, Thailand lost to Vietnam, and Indonesia also lost to Singapore. Thailand would go on to lose the third place game to Indonesia in a penalty shootout. In the final, the title was to elude the hosts as they went down 1–0 to unfancied Singapore in one of the competition’s biggest shocks to date. 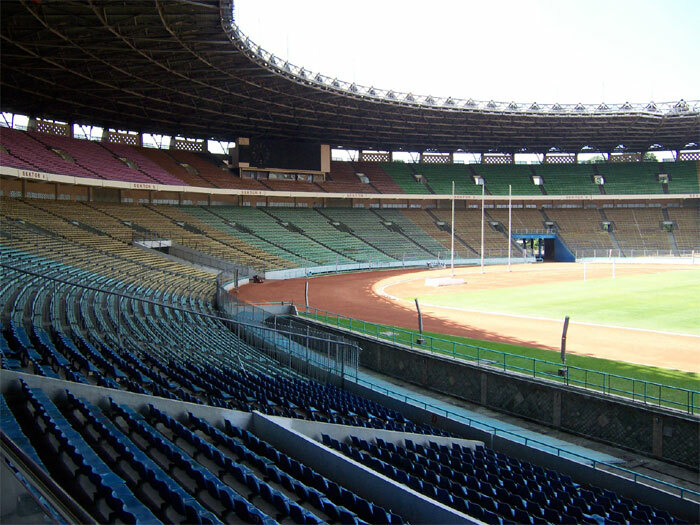 The Indonesian home stadium is the Gelora Bung Karno Stadium, Jakarta. The stadium capacity is 88,083. The stadium is the largest Stadium in Indonesia, it is also the largest stadium in South East Asia and the 10th Biggest football stadium in the world. It is located inJakarta, Indonesia. The stadium was built in 1960 for the 1962 Asian Games and is the home stadium of Indonesia football team up to present.